Even the best quality sports surfaces will require maintenance and care and will begin to become worn, dangerous and eventually in need of repair. Flooring materials such as macadam, synthetic turf, polymeric and artificial clay will eventually need to be renovated. 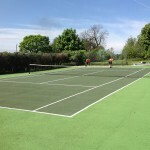 We carry out UK tennis court repair nationwide to ensure that users are completely safe and they will get the best performance characteristics from their outdoor sport facility. When choosing a specialist contractor to carry out work, such as a crack repairs, it is vital to make sure that they have all the correct certifications and accreditations to prove they are a high quality company. You can get in touch with us straight away to discuss all of the services we offer and receive a quote for repairs or maintenance. Just fill in he contact form shown on this page and let us know what we can do for you. One of our experts will reply back as soon as possible to give you some more advice. 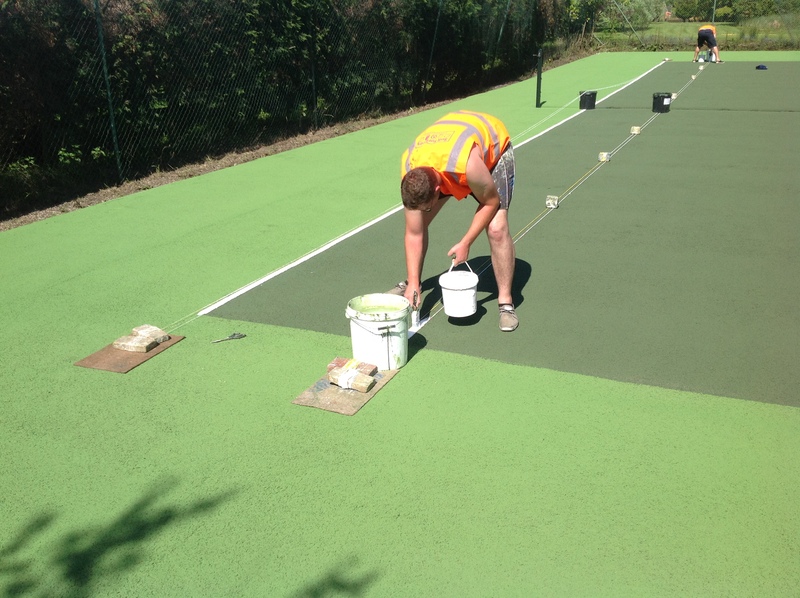 Making sure that your MUGA flooring is repaired quickly and carefully when there are the first signs of damage is important to make sure that you get the most out of your surface’s life span. If you leave it too late you will need sports court resurfacing which takes a lot of time and can be very costly in comparison to a simple crack tennis court repair job. We have a contracting team of professional and highly trained workers who make it their goal to fix and maintain tennis courts and other outdoor facilities to ensure maximum potential from each one. 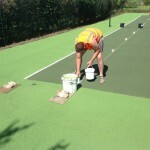 UK tennis court repair specialists will make sure you get a high quality job for a fair price that adhere to the criteria set by tennis governing bodies such as the ITF, LTA and SAPCA. 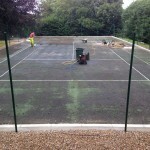 We always advise that you carry out regular proactive tennis court maintenance to reduce the needs for resurfacing work. 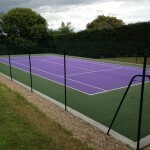 If a hard court such as macadam or polymeric rubber is not maintained properly, issues can begin to show more quickly. If you don’t keep the sport surfacing clean through brushing and pressure washing, dirt can get stuck within the pores of the surfacing and stop water draining away. This then leads to weeds, moss and algae growing on the surface and making the court slippery and unsafe for players as well as causing any coloured paint coatings to fade. 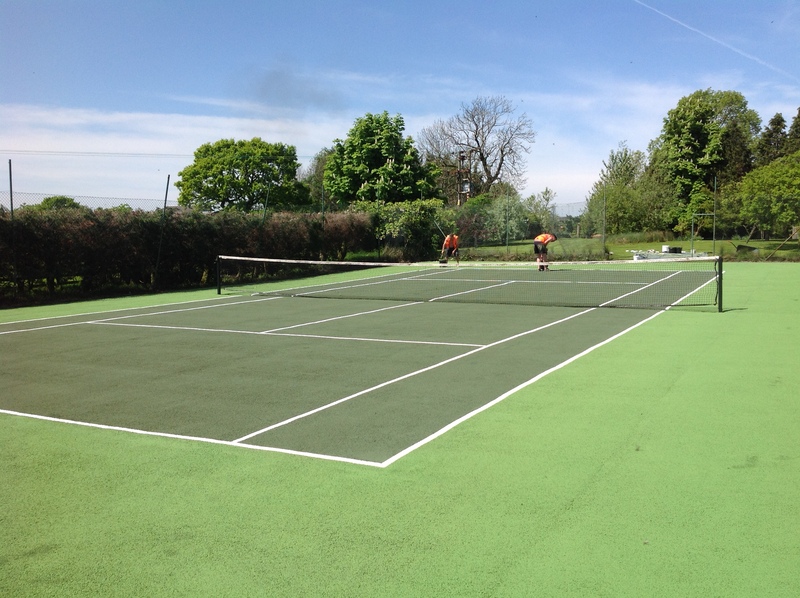 In order to prevent these issues, it is vital to look after your hard court tennis surfaces properly all year round. We can offer professional sports flooring maintenance services to help you keep your macadam or rubber court clean and playing with the best characteristics for recreational and competitive use. Without regular cleansing, your tennis court facility could become not very safe to be used, and eventually become defective. 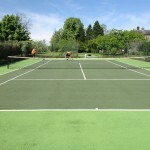 There are a selection of tennis court cleaning restoration and tennis court repair procedures which can be used to eliminate dirt and pollutants from your surfacing. 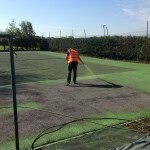 In case you have a hard court spec like macadam or polymeric rubber, frequent brushing and jet washing is regarded as the most frequent type of work that you can do. The brushing and jet washing is done to blast away any natural matter or dust in addition to stopping the development of pollutants like algae and moss. 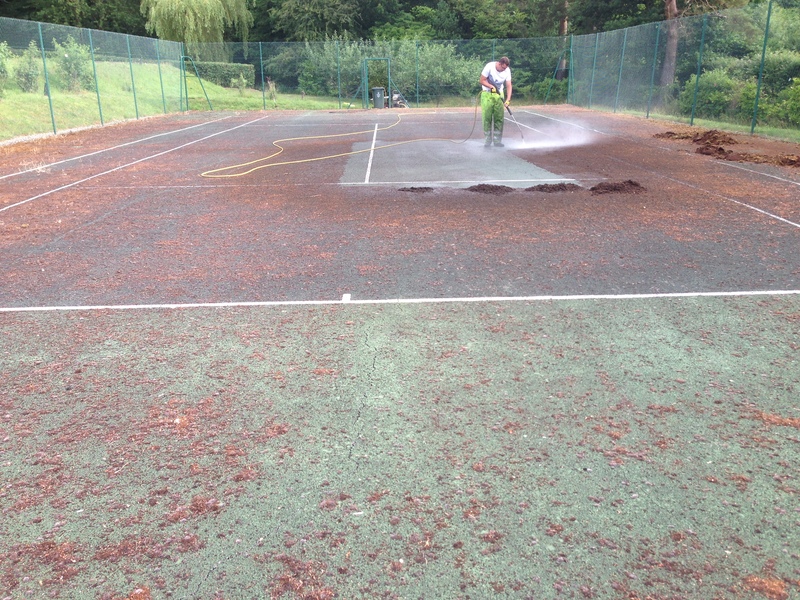 Tennis court repair and restoration on man made grass courts usually requires tennis court cleaning through drag brushing inside the silica sand infill, and reviving the surfacing by taking out and upgrading the sand. The drainage on your facility is vital for making without doubt the facility may be used all year long as well as to protect against any water damage, expert remedies can be used to avoid the increase of particular contaminations. Using a regular schedule for the surface means you are in a position to minimising any harm and make sure that the whole facility is safe to use for players throughout the year. Be sure to speak to our experts if you need some more advice on these services. We’ll supply you with some product sheets and additional information to help. It is important to have any kind of required repairs carried out, to make certain the surface performs well and is also safe for usage. If you check out the facility for any problems, it will be easier to see damages and fix them. Work can be done to correct these damages by cleaning the area, spraying a brand new application of paint and filling in chips with a specialist blend of emerald stone. Well-known complications which can happen include poor water drainage, cracks in the surface, fretting macadam or exhausted anti slip coatings. Repair work can be done to mend these problems by filling in holes with an emerald stone combination, completing a comprehensive clean to assist drainage, and implementing a new layer of anti-slip paint. If you ignore to these issues can result in more harm to happen to the facility, this will mean that more expenditures will have to be paid to really make the surfacing safe again. If you don’t fix the damages, then your facility can get to the stage where a high priced full sized resurface job is necessary to fix the court making it safe again. 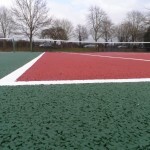 Making sure that you fix your MUGA surfacing quickly when there is a sign of any damage or potential weakness will help save money and ensure that you will not have to go through the expensive process of getting a new facility installed. It’s important to make sure you get any problems fixed as soon as possible to prevent the issue from developing further. Without the correct reactive maintenance, the tennis facility can lose its playing qualities meaning it doesn’t meet LTA accreditations anymore. Repair costs depend on the severity of damage in question and the location of your facility in the UK. The price for a full relining and repainting process will vary massively from the price of an isolated repair job that is only on a small proportion of the surface. In order to receive an accurate price for sports pitch construction, maintenance, painting, line marking etc. you will need to provide us with information of location, size and dimensions, photos of the current area and the type of tennis surfacing required. Have a look at this video below which shows repair maintenance that we carried out for a macadam surface which had become damaged and contaminated. We did a thorough clean across the whole area and applied a new anti slip paint coating with blue for the main playing area and green for the runoff, as well as white line markings. Repair jobs done by a professional sports construction contractor will instantly transform your court allowing it to appear and play like it is brand new. In many cases it is a much more cost effective way of prolonging the life of your facility than having resurfacing carried out. 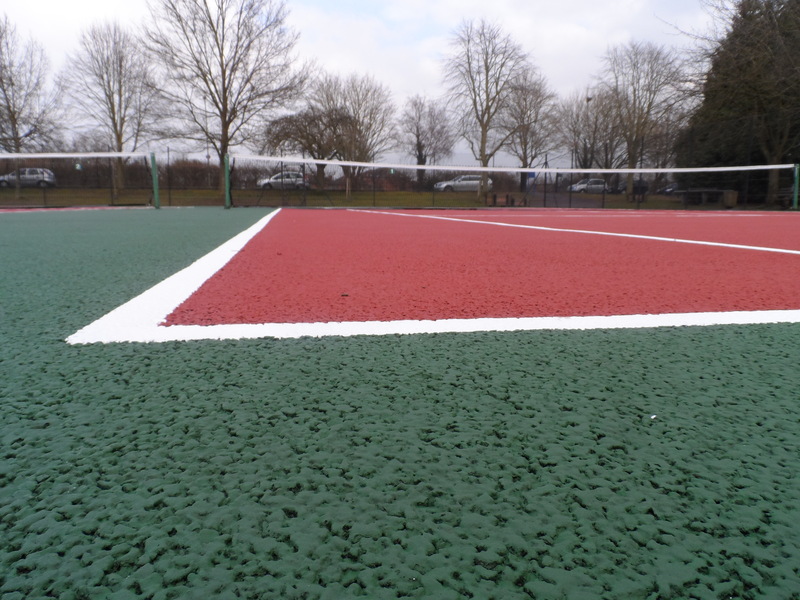 Sports surfacing crack repair costs can vary greatly depending on the condition of the surface and the work which needs to be carried out however the quality of the job is never compromised. Through regular proactive cleaning and maintenance of your sport surface, you can help to keep future costs down as it will be less likely that it will need a resurface. 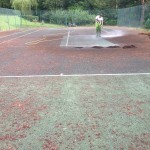 If you need a quote for carrying out maintenance or fixing damage for your macadam, polymeric or synthetic grass sport surface, please get in touch with us and we’ll get back to you with an estimate of costs to do this tennis court repair work. Our staff will be able to answer any questions you have, so be sure to fill in our contact form.